“Grace Kelly has an electric charisma on-stage that instantly ignites the room,” says, bandleader Jon Batiste of CBS's The Late Show with Stephen Colbert. 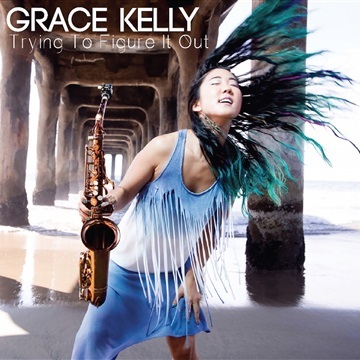 Saxophonist, singer, and composer Grace Kelly plays with the heart and passion of an old soul yet with the genre-bending zest and energy of a 25-year-old. Having been a regular on The Late Show with Stephen Colbert’s band, Jon Batiste and Stay Human, Grace Kelly’s 10th CD Trying To Figure It Out was voted #2 Jazz Album of The Year in 2016 Downbeat Magazine Readers Poll. With the upcoming recording of a new live-in-the-studio set, the rule-breaking jazz musician Grace Kelly is preparing to cross yet another line. A portion of the album will be previewed with the streaming of a Facebook Live session to a worldwide audience Kelly hopes will include everyone from her own contemporaries - millennials - to open-minded veteran music lovers. Kelly is no stranger to finding innovative ways of getting her music out to larger audiences. Via Facebook, Instagram, and her Youtube channel, she has released more than 50 “PopUp” videos that feature her playing in non-standard live settings - including locations as unexpected as a gondola in Venice, in the water in Labadee, Haiti, and in New York’s Times Square, the latter in a spirited duet with Leo P. “I have had so much fun doing those, I wanted to find other ways to present my music so it feels like an experiential thing for everybody,” Kelly said, citing the new project as an example.